The HSE defines stress as ‘The adverse reaction people have to excessive pressure or other types of demands placed on them. It is the body’s natural response to a demanding situation’. We all need a certain amount of pressure to keep mentally alert and motivated, but crossing the line from ‘enough’ to ‘too much’ leads to stress which affects work performance, health and well being - the start of a downward spiral if not eliminated. Stress is now recognised by the medical profession. In some medical practises the promotion of a good health regime is being instigated by the prescription of sessions to a local gym and referrals to local beauty clinics for complementary therapies. Typical therapies include aromatherapy and therapeutic massage as an aid to assist combating stress and tension. Clearly this gives high credibility to such treatments. It is common knowledge today that most people realise stress can be one of the main causes of staff needing time away from their workplace. Stress can develop in mild forms where in some cases, just a weekend away can be enough to dissipate the anxiety (by having 48 hours away from the trigger). However, for many, that just is not enough as the person has unwittingly allowed the problem to build up to such an extent that something far more serious occurs, requiring weeks or even months to recover. This applies to the whole spectrum of the workforce. From the cleaning staff to the Managing Director, stress has the ability to affect anybody. What is important is that both the employee and employer are aware of the signs and symptoms in order to recognise when there is a problem and so intervening before it escalates out of hand. In 2011/2012 10.4 million working days were lost due to ‘stress, depression and anxiety’. An average of 24 days were taken off for each case. Up to ½ million people in the UK have work related stress often resulting in illness. 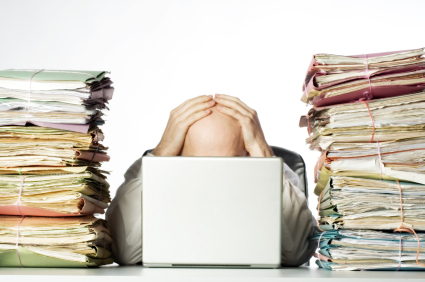 Up to 5 million people in the UK are ‘very’ or ‘extremely’ stressed through work. ‘Stress, depression and anxiety’ are the second most commonly reported work related illnesses. The first is ‘musculoskeletal disorders’. The following sectors showed high prevalence of self reported illness due to work. Repetitive strain injury (RSI), musculoskeletal and other work related stresses are on the increase. In the UK 25% of absenteeism is due to Stress. In the UK 30% is due to back problems. Physical Stress is bodily and shows in illness, tiredness and lethargy. Muscles are sore, stiff and tense and posture suffers as the person slouches through fatigue. Skin is dull and hair appears lank. Sleep patterns are very erratic. Mental Stress is emotional and more difficult to rectify. Depression, mood swings, anger, frustration, confusion, paranoid behaviour, jealousy or withdrawal are all familiar signs in general. Factors which effect stress levels (excluding work pressures) include illness, alcohol, smoking, exams, pregnancy, divorce, moving, death in family, lifestyle, drugs, poor nutrition, unemployment, poor sleep and an overactive mind.